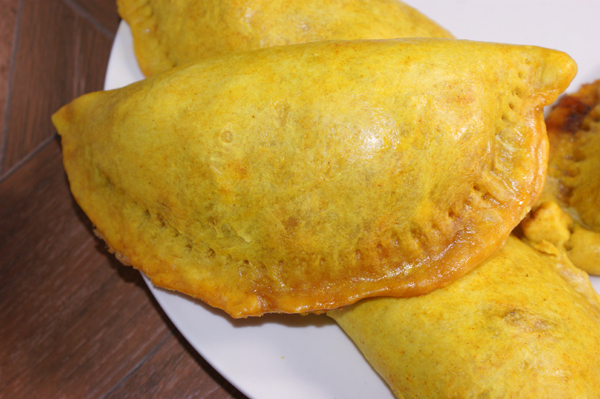 Jamaican patties are big, vibrant yellow (sometimes even violently yellow), half moons, stuffed with a well seasoned spicy ground beef mixture. Cumin, red pepper, and onion are among the traditional seasonings. The bright yellow crust comes from turmeric in the dough. The texture is kind of like a flaky pie crust. If you’ve ever had an Emapnada you’ll find patties to be similar in texture and construction, if not flavor. 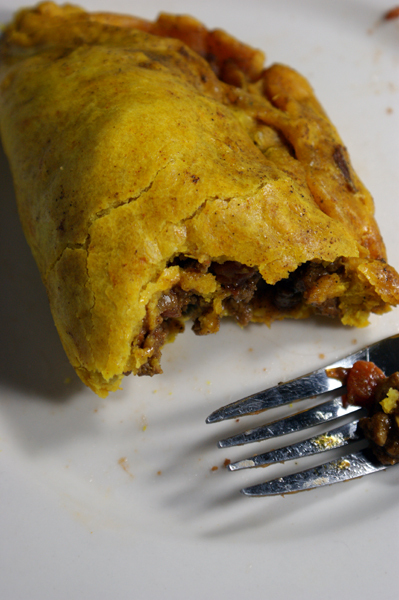 In Jamaica patties are eaten for pretty much any meal of the day, breakfast included. They are also often paired with coco bread to make a fuller meal. (Actually you make a sandwich with the patty and the coco bread by opening up the bread and stuffing the patty inside.) Which I suppose makes no sense as patties already have a carby crust. But really can you object to extra bread/carbs? I think not. Once the family ended up in NYC my Grandma stopped making the patties at home since they could be purchased inexpensively, fresh made, from vendors in the city. (If you live in NYC and haven’t tried a Jamaican Patty get on it!) When I was a little kid visiting my Grandparents in NY they always took me to purchase patties. We would have patties for dinner or even breakfast several times while I was in town. Sadly, my grandmother no longer remembers her recipe, so I’ve had to cobble together a recipe the best I can based on tastes I remember. My mother in law, who loves a good cooking challenge helped me with project and we had a blast. As we worked on the recipe we took into account some practical considerations, such as ease of finding ingredients, or using the simplest method possible to create a crisp crust in my less then perfect home oven. So, this recipe may not be perfectly authentic but it does make a darn good patty, fairly similar to those I remember as a kid. 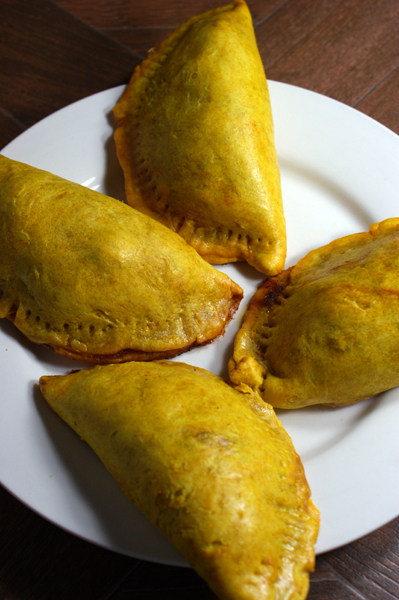 Perhaps that means I should have have called these Jamaican inspired patties? But I feel like that sounds kinda silly. So, anyway, we’re going with plain ole’ Jamaican Patties. 1. In the bowl of a large stand mixer add butter, flour, white wine, water, and turmeric. Mix on the dough setting using the dough hook until well combined. A coarse dough will form. 2. Add the milk or cream a tablespoon at a time mixing in-between. Continue to add cream until a smooth dough forms. 3. Remove the dough from the bowl and form two large balls. Wrap each ball in plastic wrap and allow the dough to rest in the fridge for 1 hour. 1. Heat a large sauté pan to medium high heat. Add the butter or a splash of oil. Add the onion, garlic, and scallions and sauté until the onion become translucent and the garlic browns. Stir frequently to prevent burning. 2. Add the ground beef to the pan and brown. Breaking up the meat with a spoon as you brown. Traditional Jamaican Patties actually have the meat broken up very fine. I personally prefer a more textured filling and do not break up the meat as much. 3. When the meat is browned add the thyme, turmeric, cumin, allspice, cardamon, parsley, and scotch bonnet (or red pepper). Stir well to mix in the spice. 4. Add the can of diced tomatoes and their juice to the pan and the beef broth. Stir well. Allow the mixture to come to a gentle boil. The mixture needs to cook down until all the liquid has evaporated from the pan. This can take quite a while. Stir periodically to prevent burning. 5. When the liquid has evaporated allow the meat to cool prior to assembling the patties. 1. Prepare the dough by making six inch circles.There are two possible method to prepare the dough. The first: Divide the dough into four sections. Use a rolling pin, roll out one section of dough at a time to about 1/8inch thickness. Use a knife to cut of six inch circles from the dough. Repeat until all the dough has been used up. OR The second: Divide the dough into one and one half inch balls. Using a tortilla press flatten each ball to about 1/8 inch thick six inch in diameter circles. 2. In the middle of each circle of dough place about 1/4 cup of meat filling (or as much meat as you can fit and still fold the dough in half and seal without losing filling out the edges). Fold the circles in half and seal the edges by lightly brushing with water and pushing together gently. 3. Place each patty on a foil lined baking sheet. 4. In a small bowl wish together an egg and a splash of water. Brush each patty with the egg mixture. 5. Bake the patties at 350* for 25-35 minutes until the dough is crisp and cooked through. Cool slightly before serving. 1. Turmeric stains everything (counters, fabric, your hands) really really easily. Be careful what you set your dough on, and wipe up anything that splatters quickly to prevent staining. 2. Jamaican Patties freeze really well. Place them in an air tight container or ziplock bag and freeze for up to two months. To defrost place in the oven at 350* until warm (About 10-15min). 3. The patty filling tastes absolutely fantastic over couscous if you end up with any leftovers. 4. This is a time consuming recipe. I find making the dough and filling in one day and assembling the next to be easiest. The dough can remain refrigerated if wrapped very tightly in the plastic wrap for up to a week. Looks great! how many patties does this recipe yield? Thank you! Well, I guess that would be helpful information wouldn’t it? This recipe yields ten to twelve patties depending on how well you stuff em’ and how thin you end up getting the dough. Dear Michelle, being straight from Jamaica myself and having read your blog, some of what you said concerns me. First off, Jamaica is an island which is approximately 146 miles long and 51 miles wide of highly mountainous topography. Many areas undulate between over 1000 – 7500 ft above sea level. By car, going as fast as possible in terrain such as this would not make the entire length in less than 5 hours so it is inconceivable that a child riding a bike from one to the other in a day would return home unscathed for dinner. My second thought was your mentioning of “no proper patties can be found” in Florida where your grandparents moved to. if they went all the way south to around Dade and Broward counties, surely they can find several. I lived there for over 20 years and some great ones are made and sold there. I know there are places in Orlando, St. Petersberg as well as Tampa. Otherwise, frozen patties are also sold at Walmart, Sam’s Club and Costco. I am certainly going to try your recipe… never had ANY patty, including my own recipe include tomatoes, cardamom or finishing the pastry with an egg wash before. I will try it to feel this out. But I am sure your idea has lots of merit. All good and best! Hey thanks for taking the time to leave such an awesome comment. I will try my best to answer everything you brought up! First, I am aware that Jamaica is a fairly large island and home of the Blue Mountains (and others). However, I have to admit I never thought that hard about the story. Obviously, it would’t be possible for a child to bike from end to end in a day. I’m pretty bad at math, but even I can calculate that one. :) Perhaps this is one of those family stories that grows in the telling? I suspect my family has a lot of those. Or quite possibly I’m miss-remembering a story I was told as a kid. Either way I do know, that a kid, my dad did get to play outside and roam freely for the day, with the only stipulation being they were home in time for dinner. He would take off on his bike and not return for hours and hours. My dad is an adventurous sort, and I do know he made it to many places he probably shouldn’t have (queries, waterfalls, and mountainous locations included). I always loved his sense of freedom and joy that came from being allowed to roam and explore in this way, which is probably what I wanted to convey when I wrote this post. I suppose I’ll have to fact check the story with my dad at some point. I probably should not have spoken so broadly as to insult the entire state of Florida’s patty making skills. Highly likely there are decent even excellent patties to be found in Florida. (Just not near my Grandparents house so far! Somehow they aways have a funny texture going on in the crust. Not so good in my opinion.) Please forgive my exaggeration. You are correct that in some places patties can be purchased at Walmart/Sam’s Club/Costco. But, actually, not at MY Walmart/Sam’s Club/Costco. Seriously. I’ve looked. More then once. I live in an area with a fairly large Hispanic population, meaning you can find some seriously AMAZING Mexican food, and ingredients at my local Sam’s. But not so much on the Jamaican food. Recently, I have discovered that the dollar store carries frozen patties, but I definitely didn’t know that at the time of writing this post. We also have a Jamaican restaurant that I’ve heard sells amazing food, which I also didn’t know about at the time of writing. I will definitely make the trek and taste for myself soon. Fair enough on the ingredients being different then you are used to. I’m not trying to claim this recipe to be perfectly authentic. Though after re-reading my post today I do see I could have made that point clearer. I will actually go back and edit the post to do so. I should add that My Grandmother doesn’t remember her patty recipe nor does she have the cookbook which she wrote it down in; so this recipe that I’m sharing is my own, cobbled together the best I can based on tastes I remember. I made my best guesses at spices (i.e. cardamon) and made other choices based on practicality. For example, I found the egg wash to give me a nicely colored crust in my oven. Or another example: from what I understand an authentic crust for a patty would probably be made with lard, and I chose not to do that for ease of gathering ingredients. (Lard is fairly difficult to find in my area without hitting up a butcher.) However, I will say I actually have had patties (other then mine) with tomatoes in them. I also have found a lot of Jamaican cooking to contain tomato, so it seemed like a reasonable place to start to me. Perhaps this is not common, but I have to say I love it. Again, I fully admit this is most likely not a perfect authentic recipe. However, I do think if you try it you will find it to be tasty, if a little different then your own recipe. If you do try it, I’d certainly like your feedback! Again, thanks again for taking to leave such a thoughtful comment.